Roswell Pro Audio has released a superb mini condenser microphone, the Mini K47, that sounds stellar and is surprisingly affordable. I was able to get a set of them in my recording studio and put together this percussion piece to test out the mics. I recorded only with the Mini K47s with no eq, compression, or processing. 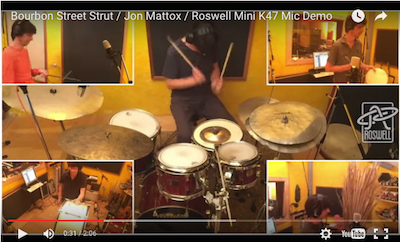 The 5 parts (drum set, orchestral bass drum, frame drum, rebar sticks, and a frond) were all performed live and the the video was edited by the Roswell Pro Audio team.